1962 – Mariner 2 (US) – first successful flyby of Venus; confirmed high surface temperatures and pressures, a carbon dioxide rich atmosphere, continuous cloud cover, and the slow retrograde rotation of the planet. 1967 – Venera 4 (USSR) – first spacecraft to survive entry into another planet’s atmosphere. Returned atmospheric data, and deployed a parachute system to an altitude of 25km, becoming the first successful probe to perform in situ analysis of another planet’s environment. Surface photo of Venus by Venera 13. Credits: NASA/NSSDC. 1967 – Mariner 5 (US)– successful flyby returning data on magnetic fields and plasmas, as well as UV emissions from the atmosphere. 1969 – Venera 5 and 6 (USSR) – atmospheric probes detected the presence of nitrogen and oxygen. 1970: Venera 7 (USSR) – first soft-landing on Venus and the first time data was returned from a manmade object after landing on another planet. It measured a surface temperature of 475°C and a surface pressure of 90 bar. 1972: Venera 8 (USSR) – landed on Venus and was the first to measure wind speeds as it descended through the atmosphere (from 100 metres/second above 48 kilometres to 1 metre/second below 10 kilometres). 1974: Mariner 10 (US) – Venus flyby en route to Mercury; tracked global atmospheric circulation with visible and ultraviolet imagery. It was the first spacecraft to have an imaging system. 1975: Venera 9 and 10 (USSR) – First spacecraft in orbit around Venus. They photographed the clouds and looked at the upper atmosphere, while the landers returned the first black and white panoramic images of the surface. 1978-1992: Pioneer Venus 1 and 2 – included a large entry probe and three smaller entry probes, providing vertical profiles of the atmosphere. Also the first orbiter to make radar mapping of the surface. Over a decade, it recorded a 90% decrease of sulphur dioxide, possibly indicating a large volcanic eruption just before the arrival. 1978 Venera 11 and 12 (USSR) – successful landing on the surface, and detection of lightning and thunder. 1982: Venera 13 and 14 (USSR) – the landers sent back the first colour pictures of the surface. 1983: Venera 15 and 16 (USSR) – the orbiters provided radar maps and atmospheric analyses. 1985: Vega 1 and 2 (USSR) – released landers and balloons at Venus en route to Halley’s comet that recorded winds running at 240 kilometres/hour. Landers provided precise temperature profiles down to the surface and in situ measurements of cloud composition. 1990-94: Magellan (US) – mapped 98 per cent of the surface of Venus using synthetic aperture radar, at a resolution of 300 metres per pixel. 1990: Galileo (US) – flyby en route to Jupiter. First spacecraft observations of Venus’ lower clouds and spectral imaging of the night side near infrared emissions. 1998, 1999: Cassini-Huygens (US, ESA) – flybys en route to Saturn. 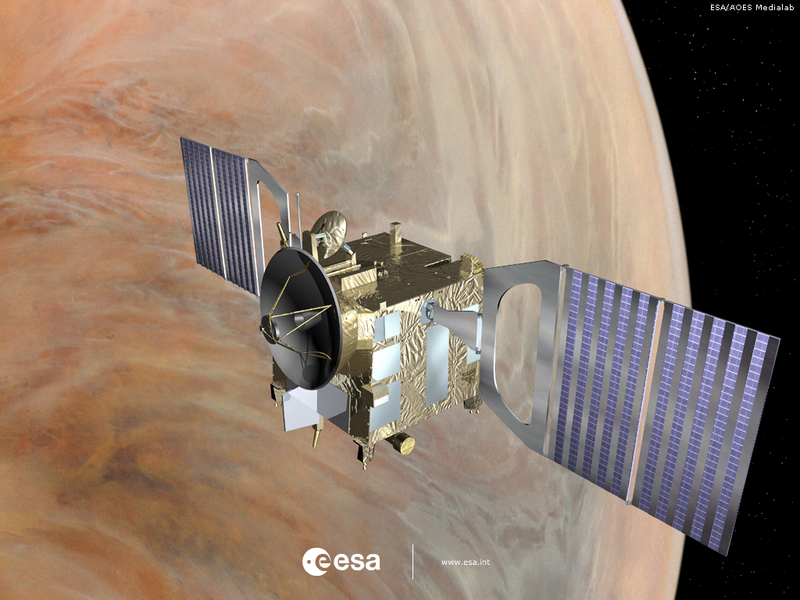 ESA's Venus Express has been in orbit around Venus since 2006. Credits: ESA. 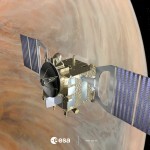 2006 – present: Venus Express (ESA)– the first European spacecraft to orbit Venus. 2006 and 2007: Messenger (US) – flybys en route to Mercury. 2010: Akatsuki (JAXA) – Japanese orbiter, failed orbit insertion but a second attempt will be made in 2015. 2015+: Bepi-Colombo (ESA) – with a scheduled launch in 2015, two flybys of Venus are planned en route to Mercury. Note that the dates marked are those of operation at Venus, rather than launch dates. 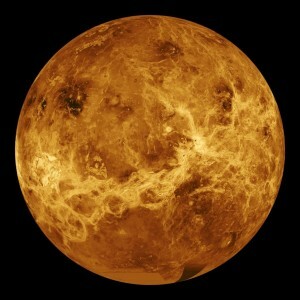 This entry was posted in Transit of Venus and tagged Planet Venus, Venus Express. Bookmark the permalink.